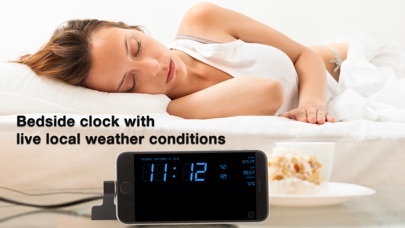 Sleep better & wake up easier with our smart alarm clock. In daily life, it reminds you to finish important things in perfect time. In addition, with bedside clock, weather conditions, calendar and nightstand mode with changeable brightness to protect your eyes for a good night’s sleep. With voice alarm just like your sweet personal assistant to remind you, so that everything can be easily solved. What even is this app? I don’t even know where to begin... First, the weather: The app doesn’t display or use any information concerning the weather. It does however show the humidity and current temperature but that’s about it. The only setting you can change is the degree scale you want to use (F or C). Second, the alarm: This setting doesn’t even work. The alarm can only be set for a time remaining for that same day, not allowing for an alarm for the next day. Also, the alarm doesn’t keep itself if you close the app, and there is no sound or voice that happens when the alarm is suppose to occur. This app was the worst waste of a dollar ever spent. None of the things said in the description of the app work. The only “setting” that can be changed are the alarm clock- setting the alarm for a time for that current day, the brightness setting for the clock display and the main screen, a “repeat button” which I can’t figure out it’s purpose because there is no different in the app function with this either on or off, and the temperature system you want to use. I truly wish that there was a rating system lower than a single star because I think that a star is too high a rating for an app of this quality, but as it is the lowest option for rating, it’ll have to do.